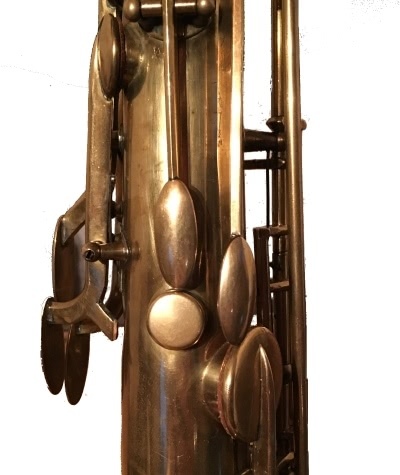 Paul A. sent me a photo of his alto sax in response to my previous post on a saxophone with two octave keys. His saxophone also has two octave keys, and it has a short bell. Contemporary saxophones have a longer bell, go down to B flat, and have two large pads on the bell. Paul’s saxophone has a shorter bell, only goes down to B, and only has one pad on the bell. Here’s a closeup of the octave keys. Paul says he found his instrument in an antique shop. It has no serial number or manufacturer information. If you know anything about this model, please leave a comment below. 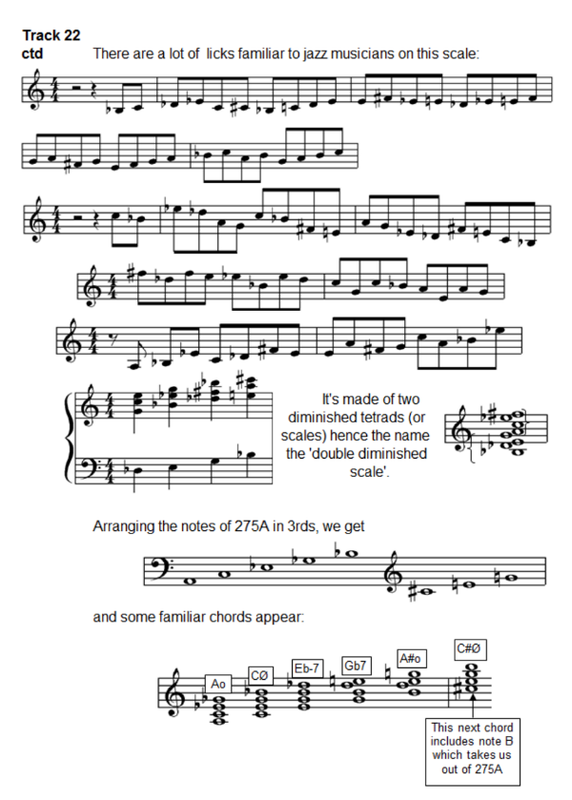 Pete White contacted me in response to a blog post I wrote enumerating musical scales. He has written a book on the subject, with audio, that he is giving away. He asked if I would host the content, and I am hosting it here. Here are a couple screen shots from the book to give you an idea what it contains. Here’s an example scale, number 277 out of 344. And here’s an example of the notes for the accompanying audio files. 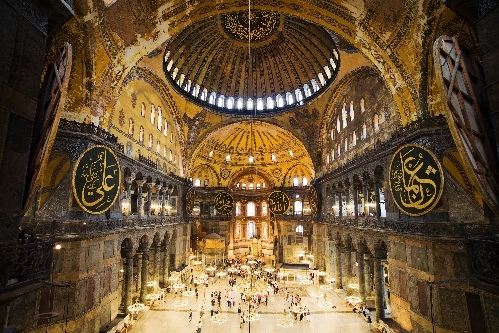 The Hagia Sophia (Greek for “Holy Wisdom”) was a Greek Orthodox cathedral from 537 to 1453. When the Ottoman Empire conquered Constantinople the church was converted into a mosque. Then in 1935 it was converted into a museum. No musical performances are allowed in the Hagia Sophia. However, researchers from Stanford have modeled the acoustics of the space in order to simulate what worship would have sounded like when it was a medieval cathedral. The researchers recorded a virtual performance by synthesizing the acoustics of the building. Not only did they post-process the sound to give the singers the sound of being in the Hagia Sophia, they first gave the singers real-time feedback so they would sing as if they were there. 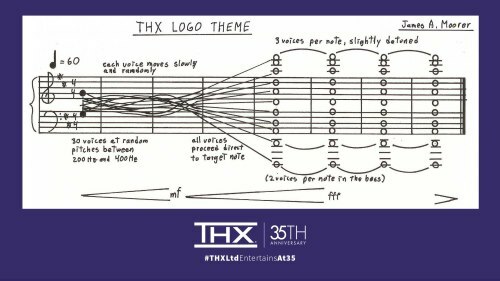 I just finished listening to the latest episode of Twenty Thousand Hertz, the story behind “Deep Note,” the THX logo sound. There are a couple mathematical details of the sound that I’d like to explore here: random number generation, and especially Pythagorean tuning. First is that part of the construction of the sound depended on a random number generator. The voices start in a random configuration and slowly reach the target D major chord at the end. Apparently the random number generator was not seeded in a reproducible way. This was only mentioned toward the end of the show, and a teaser implies that they’ll go more into this in the next episode. The other thing to mention is that the final chord is based on Pythagorean tuning, not the more familiar equal temperament. The lowest note in the final chord is D1. (Here’s an explanation of musical pitch notation.) The other notes are D2, A2, D3, A3, D4, A4, D5, A5, D6, and F#6. Octave frequencies are a ratio of 2:1, so if D1 is tuned to 36 Hz, then D2 is 72 Hz, D3 is 144 Hz, D4 is 288 Hz, D5 is 576 Hz, and D6 is 1152 Hz. If D2 is 72 Hz, then A2 is 108 Hz. It follows that A3 would be 216 Hz, A4 would be 432 Hz (flatter than the famous A 440), and A5 would be 864 Hz. The F#6 on top is the most interesting note. Pythagorean tuning is based on fifths being a ratio of 3:2, so how do you get the major third interval for the highest note? By going up by fifths 4 times from D4, i.e. D4 -> A4 -> E5 -> B5 -> F#6. The frequency of F#6 would be 81/16 of the frequency of D4, or 1458 Hz. The F#6 on top has a frequency 81/64 that of the D# below it. A Pythagorean major third is a ratio of 81/64 = 1.2656, whereas an equal temperament major third is f 24/12 or 1.2599 . Pythagorean tuning makes more of a difference to thirds than it does to fifths. A Pythagorean major third is sharper than a major third in equal temperament. Some describe Pythagorean major chords as brighter or sweeter than equal temperament chords. That the effect the composer was going for and why he chose Pythagorean tuning. Then after specifying the exact pitches for each note, the composer actually changed the pitches of the highest voices a little to make the chord sound fuller. This makes the three voices on each of the highest notes sound like three voices, not just one voice. Also, the chord shimmers a little bit because the random effects from the beginning of Deep Note never completely stop, they are just diminished over time. The exponent is 7/12 because a half step is 1/12 of an octave, and a fifth is 7 half steps. The exponent is 4/12 because a major third is 4 half steps. Musical score above via THX Ltd on Twitter. How many musical scales are there? For this post, I’ll only consider scales starting on C. That is, I’ll only consider changing the intervals between notes, not changing the starting note. Also, I’ll only consider subsets of the common chromatic scale; this post won’t get into dividing the octave into more or less than 12 intervals. 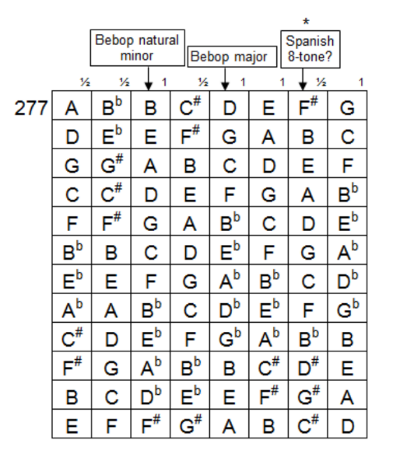 First of all we have the major scale — C D E F G A B C — and the “natural” minor scale: A B C D E F G A. The word “natural” suggests there are other minor scales. More on that later. Then we have the classical modes: Dorian, Phrygian, Lydian, Mixolydian, Aeolian, and Locrian. These have the same intervals as taking the notes of the C major scale and starting on D, E, F, G, A, and B respectively. For example, Dorian has the same intervals as D E F G A B C D. Since we said we’d start everything on C, the Dorian mode would be C D E♭ F G A B♭ C. The Aeloian mode is the same as the natural minor scale. One way to enumerate all possible scales would be to start with the chromatic scale and decide which notes to keep. Write out the notes C, C♯, D, … , B, C and write a ‘1’ underneath a note if you want to keep it and a ‘0’ otherwise. We have to start and end on C, so we only need to specify which of the 11 notes in the middle we are keeping. That means we can describe any potential scale as an 11-bit binary number. That’s what I did to carry out an exhaustive search for scales with a little program. There are 266 scales that meet the criteria listed here. I’ve listed all of them on another page. Some of these scales have names and some don’t. I’ve noted some names as shown below. I imagine there are others that have names that I have not labeled. I’d appreciate your help filling these in. Update: See this page for Pete White’s free ebook listing all possible scales with 3 to 11 notes. What key has 30 sharps? Last year I wrote a post about saxophone octave keys. I was surprised to discover, after playing saxophone for most of my life, that a saxophone has not one but two octave holes. Modern saxophones have one octave key, but two octave holes. Originally saxophones had a separate octave key for each octave hole; you had to use different octave keys for different notes. 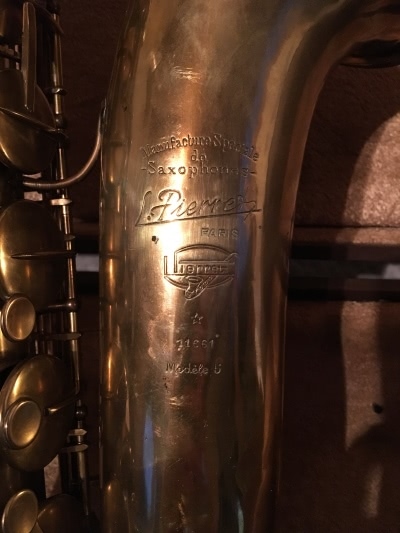 I had not seen one of these old saxophones until Carlo Burkhardt sent me photos today of a Pierret Modele 5 Tenor Sax from around 1912. And here’s a closeup of the bell where you can see the branding. 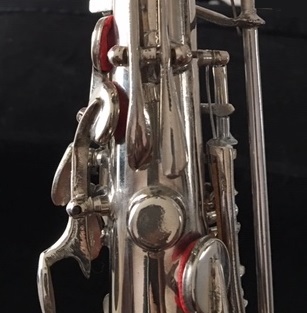 Update (2019-01-22): A reader, Paul A., sent me photos of a silver alto sax with two octave keys. More on this saxophone here. The other day I wrote about the golden angle, a variation on the golden ratio. If φ is the golden ratio, then a golden angle is 1/φ2 of a circle, approximately 137.5°, a little over a third of a circle. Musical notes go around in a circle. After 12 half steps we’re back where we started. What would it sound like if we played intervals that went around this circle at golden angles? I’ll include audio files and the code that produced them below. A golden interval, moving around the music circle by a golden angle, is a little more than a major third. And so a chord made of golden intervals is like an augmented major chord but stretched a bit. An augmented major triad divides the musical circle exactly in thirds. For example, C E G#. Each note is four half steps, a major third, from the previous note. In terms of a circle, each interval is 120°. Here’s what these notes sound like in succession and as a chord. If we go around the musical circle in golden angles, we get something like an augmented triad but with slightly bigger intervals. In terms of a circle, each note moves 137.5° from the previous note rather than 120°. Whereas an augmented triad goes around the musical circle at 0°, 120°, and 240° degrees, a golden triad goes around 0°, 137.5°, and 275°. A half step corresponds to 30°, so a golden angle corresponds to a little more than 4.5 half steps. If we start on C, the next note is between E and F, and the next is just a little higher than A. If we keep going up in golden intervals, we do not return to the note we stared on, unlike a progression of major thirds. In fact, we never get the same note twice because a golden interval is not a rational part of a circle. Four golden angle rotations amount to 412.5°, i.e. 52.5° more than a circle. In terms of music, going up four golden intervals puts us an octave and almost a whole step higher than we stared. Here’s what a longer progression of golden intervals sounds like. Each note keeps going but decays so you can hear both the sequence of notes and how they sound in harmony. The intention was to create something like playing the notes on a piano with the sustain pedal down. It sounds a little unusual but pleasant, better than I thought it would. Here’s the Python code that produced the sound files in case you’d like to create your own. You might, for example, experiment by increasing or decreasing the decay rate. Or you might try using richer tones than just pure sine waves. # values between -2^15 and 2^15 - 1. When I was in high school, one year I made the Region choir. I had no intention of competing at the next level, Area, because I didn’t think I stood a chance of going all the way to State, and because the music was really hard: Stravinsky’s Symphony of Psalms. My choir director persuaded me to try anyway, with just a few days before auditions. That wasn’t enough time for me to learn the music with all its strange intervals. But I tried out. I sang the whole thing. As awful as it was, I kept going. It was about as terrible as it could be, just good enough to not be funny. I wanted to walk out, and maybe I should have out of compassion for the judges, but I stuck it out. I was proud of that audition, not as a musical achievement, but because I powered through something humiliating. I did better in band than in choir. I made Area in band and tried out for State but didn’t make it. I worked hard for that one and did a fair job, but simply wasn’t good enough. That turned out well. It was my senior year, and I was debating whether to major in math or music. I’d told myself that if I made State, I’d major in music. I didn’t make State, so I majored in math and took a few music classes for fun. We can never know how alternative paths would have worked out, but it’s hard to imagine that I would have succeeded as a musician. I didn’t have the talent or the temperament for it. When I was in college I wondered whether I should have done something like acoustical engineering as a sort of compromise between math and music. I could imagine that working out. Years later I got a chance to do some work in acoustics and enjoyed it, but I’m glad I made a career of math. 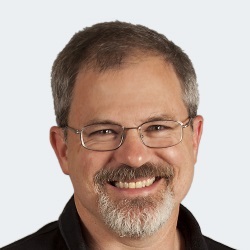 Applied math has given me the chance to work in a lot of different areas—to play in everyone else’s back yard, as John Tukey put it—and I believe it suits me better than music or acoustics would have. For many years, rivals University of Texas and Texas A&M University played each other in football on Thanksgiving. In 1999, the game fell one week after the collapse of the Aggie Bonfire killed 12 A&M students and injured 27. The University of Texas band’s half time show that year was a beautiful tribute to the fallen A&M students. Amplitude modulated signals sound rough to the human ear. The perceived roughness increases with modulation frequency, then decreases, and eventually disappears. The point where roughness reaches is maximum depends on the the carrier signal, but for a 1 kHz tone roughness reaches a maximum for modulation at 70 Hz. Roughness also increases as a function of modulation depth. where d is the modulation depth, f is the modulation frequency, and t is time. Here are some examples you can listen to. We use a pure 1000 Hz tone and Gaussian white noise as carriers, and vary modulation depth and frequency continuously over 10 seconds. he modulation depth example varies depth from 0 to 1. Modulation frequency varies from 0 to 120 Hz. First, here’s a pure tone with increasing modulation depth. Next we vary the modulation frequency. Now we switch over to Gaussian white noise, first varying depth. And finally white noise with varying modulation frequency. This one sounds like a prop-driven airplane taking off.